Who can use this Architects Appointment? It is designed for use by the architect rather than the client. 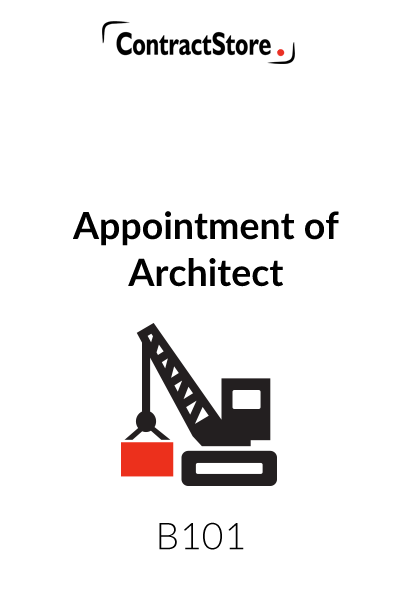 What is this Architects Appointment for? It is a straightforward appointment letter addressed to the client setting out the terms of the architect’s appointment. Professional forms of appointment, including those issued by the RIBA and other institutions can be quite complicated and our form is more user-friendly than the more formal standard documents. What are the main issues for an architect when taking on work for a client? Scope of services. It is important for the client to agree – and understand – the scope of the architect’s work and the fees that are payable as the project develops. The RIBA publishes a Plan of Work which a lot of architects use. Change risk. Clients need to understand the amount of time and effort that even an apparently minor request for a design change might involve. So, when a fee is agreed, the architect should make it clear that once designs are agreed, extra fees may be payable if the client later asks for a design change. Fees. The fees may be fixed or calculated by reference to daily/hourly rates or a mixture of the two. In our form, the client will pay fees monthly. Liability. An architect responsible for designing a building and then monitoring the construction can face a potentially large claim if something goes wrong or there is a mistake in the design. Therefore, an architect needs to have professional indemnity insurance which protects both the architect and the client. In addition, it is sensible for an architect to have a specific limit on liability in their terms of business which is linked to the insurance policy. Copyright in the designs will usually be retained by the architect and the client will have a licence to use those designs. 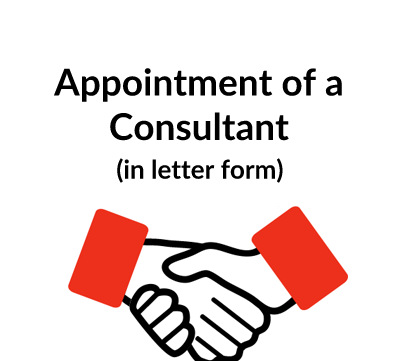 What detailed terms does the architect appointment contain? ContractStore supplies templates and is not a law firm. But all our templates are written by experienced lawyers. This appointment is written by a specialist construction solicitor. So, we can arrange legal assistance for customers who need special terms in one of our documents or a bespoke template. For more information see our Legal Services page. 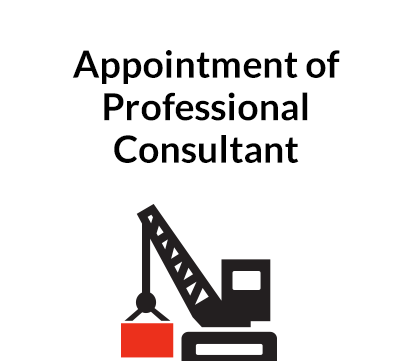 Most professional consultants in the construction and engineering industries have a professional body that regulates their affairs and, in many cases, issues standard forms of appointment for the profession. Those forms can often be lengthy and in some cases difficult for clients to understand. The last thing a client – especially a client that is not a professional property developer- wants to receive when discussing a new project is a 25 page contract. The more enlightened consultants are aware of this and prefer a more straightforward approach which nonetheless protects their interests. But there are not many short forms available. ContractStore has, therefore, produced a new form of professional appointment which has been prepared by a specialist construction lawyer for the company. This consists of a one page letter addressed to the client, a three page set of Terms of Business and two template Schedules, one of which will contain the detailed scope of services to be provided and the other will set out the fees and expenses. Our fees schedule contains sample alternative wording. In addition, the Terms of Business is included in a one-page, two column format. You can use this either as a separate document or it can be printed on the back of an invoice. Some comments on these documents. This contains some short paragraphs highlighting the key elements of the appointment and referring to the schedules, when appropriate, which will detail the services, fees etc. The letter should be prepared in duplicate with both copies sent to the client. The client is asked in the letter to counter-sign and return one copy. Once this is done, a binding contract will be created. If the client comes back with comments, then it will usually be sensible to issue a revised letter incorporating any agreed changes. There are 18 short paragraphs, most of which should be self-explanatory. Paragraph 7 dealing with fees and payment is designed to comply with English legal requirements with regard to the payment terms under construction contracts. Our template assumes monthly payments with a payment application being submitted by the seventh of each month and the final date for payment on the 28th of the month. Any variations can be dealt with the payment schedule which contains options for a fixed fee and time-based fees as well as expenses. There is also a paragraph which allows for a fee increase after 12 months and this needs to be adjusted to meet your particular requirements. Paragraph 8 deals with changes. It provides that no change will be implemented until the price (and, when relevant, the time implications) has been agreed. Paragraph 9 reserves copyright in designs etc. 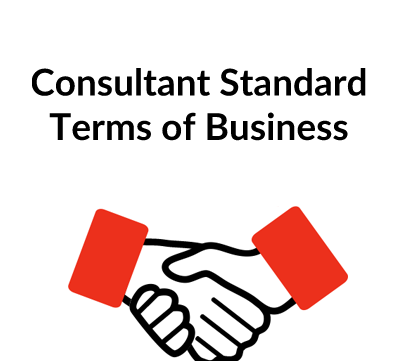 with the consultant while the client is given a licence to use them for the project but not for any other purpose. Paragraph 10 deals with professional indemnity insurance and the amount of cover needs to be inserted. Also, there is an optional sentence dealing with contamination and other risks where the insurance cover is sometimes limited. Paragraph 11 limits the consultant’s liability. In our form, the liability is linked to the amount recoverable under the professional indemnity insurance up to an overall maximum that you should insert. There is also a “net contribution” provision in the second paragraph of this section. Paragraph 12 is fairly standard, giving each party the right to terminate in certain circumstances. Paragraph 13 gives the consultant the right to suspend work if payment is not made on time. This is a statutory right in the UK and the wording of the statute is reflected here. Paragraph 14 deals with confidentiality but it does allow the consultant to publish information for marketing purposes, after getting the client’s approval. Paragraph 15 allows the consultant to sublet work but neither party can assign their interests without the other’s consent. 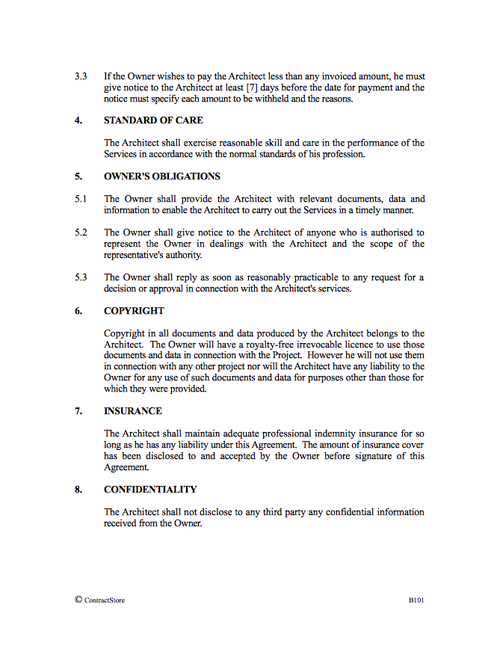 Paragraph 16 Disputes and Law provides for adjudication – in our case the RIBA procedure is used since this is popular with architects. Disputes that are not settled by adjudication will be referred to the courts.